Enhance your skills even further and increase your opportunities underwater. As your first step in continuing diving education, the Advanced course improves your skills, comfort, and knowledge underwater. You will take five specialty dives which may include: Deep, Navigation, Underwater Naturalist, Peak Performance Buoyancy, Search and Recovery, and Boat/ or Night Dive (depending upon scheduling). You will read a chapter about each of these specialties and answer knowledge reviews. Advanced and Adventure Diver are the only courses that do not require any quizzes. Maximum # of Students per instructor: 6, usually less. Includes: Equipment, PADI Advanced manual, PADI certification card. Explore all the many underwater adventures Belize has to offer. An Adventure Diver certification is available for divers who wish to complete three specialty dives instead of five (required for the Advanced certification). Possible specialties include: Deep, Navigation, Underwater Naturalist, Drift, Boat, or Night Dive. You will read a chapter about three of these specialties and answer knowledge reviews. Advanced and Adventure Diver are the only courses that do not require any quizzes. Includes: Equipment, use of book, PADI certification card. Emergency First Response trains you to be an Emergency First Responder in CPR, and First Aid, and fulfills the CPR prerequisite for the Rescue course. In a four-hour class on the dock, you will learn how to administer emergency care based on the primary care lifeline, and secondary care first aid. You will practice responding to various scenarios including performing CPR on a dummy. No prior experience is required. The course is designed to prepare a layman to manage an emergency scene until an Emergency Medical Service (EMS) arrives to the scene. Includes: Medic First Response certification card. Most divers agree that of all diving education, the Rescue course is the most rewarding. You are making a serious contribution to the diving community, while having a lot of fun learning skills and managing simulated scenarios. We will intersperse “fun diving” within the skill development dives. Prerequisites are Advanced Open Water, and a CPR certification within one year of taking the Rescue course. We will loan you a book to review, and you will take quizzes. Includes: Equipment, PADI Rescue Diver manual, PADI certification card. The Dive master course is for those divers who plan to work professionally leading dives. A Divemaster in Training (DMT) acts as an intern at the shop, supporting dive trips and student courses. In this capacity, the DMT learns how to prepare logistically for dive trips, act as a boat deckhand, dive in a professional manner, prevent and respond to problems, navigate dive sites, and ultimately, lead dives and act in a leadership capacity with divers. In addition, the DMT studies theory books to prepare for exams: Supervising Divers and Students, Divemaster Conducted Programs, Dive Skills and Environment, Decompression Theory and RDP, Physiology, Physics, and Equipment. The DMT must pass various water skills and stamina swimming tests; demonstrate Open-Water-course skills; map a dive site, and prepare an Emergency Response Plan. Prerequisites include: Rescue, CPR/First Aid, 40 logged dives, a Medical clearance signed by a doctor, and be 18 years of age. Practical Application: stamina, rescue, and assistant to instructor. Includes: Rental of equipment, Dives, PADI Dive Master Certification Card. If it’s been more than a year since you’ve been diving and you don’t quite remember the skills, well a Refresher Course is what you need. We will meet at 9AM, fit you for equipment, and spend about an hour reviewing use of equipment, diving theory, and the skills we will practice. Then, we’ll get in the boat and head to the reef where we will practice skills in shallow water (7ft/2m). When you are ready, we will head to deeper water (maximum 40ft/12m) where we will explore the reefs and find little creatures such as Arrow Crabs and Pederson Shrimps. We’ll return to the shop around 2PM. If you have a friend doing the Discover Scuba Diving this would be a good time to dive together. *You may count this experience toward an Open Water certification to be completed anywhere within 30 days. You must ask for a referral form from us. Have you ever wondered what it’s like to breathe underwater? Give diving a try with our one day introductory course to find out if diving is right for you. Safely experience breathing underwater in just one day. Discover Scuba is a good choice if you want to see how you like being underwater, or if you only have one or two days to dive. We’ll meet at 9AM, fit you for equipment, and spend about an hour reviewing use of equipment, diving theory, and the skills we will practice. Then, we’ll get in the boat and head to the reef where we will practice skills in shallow water (7ft/2m). When you are ready, we will head to deeper water (24ft/8m) and explore the shallow reefs and find little creatures such as Arrow Crabs and Pederson Shrimps. We’ll return to the shop around 2PM. If you have friends taking the Refresher, this would be a great day to dive together. Get Open Water Certified in just four days at our beautiful Barrier Reef and you will be able to dive anywhere around the world. We specialize in certifying divers in four days. Meet at 9:00AM for a day of videos, dive table instruction, and quizzes. If possible, it’s helpful to pick up a book the evening before class starts. Start diving! Meet at 8:30AM, get fitted for your equipment (included in the course), and spend about an hour reviewing the equipment and skills. Then, we’ll get in a boat and head to the reef where we’ll practice skills in shallow water (7ft/2m), before taking our first Open Water dive in a little deeper water (24ft/8m). We’ll explore the shallow reefs and find little creatures such as Arrow Crabs and Pederson Shrimps. We’ll return to the shop around 2PM. If you didn’t finish the evening before, we’ll meet in the afternoon to wrap up the classroom exercises. Meet at 8:30AM and begin to explore deeper waters. Open Water Dives 2 and 3 will generally be “outside the reef” where the “real dives” take place. We will dive to 40ft/12m. We’ll snorkel at the surface interval. These dives are generally done at the Caye Caulker Marine Reserve. We’ll return around 2PM. 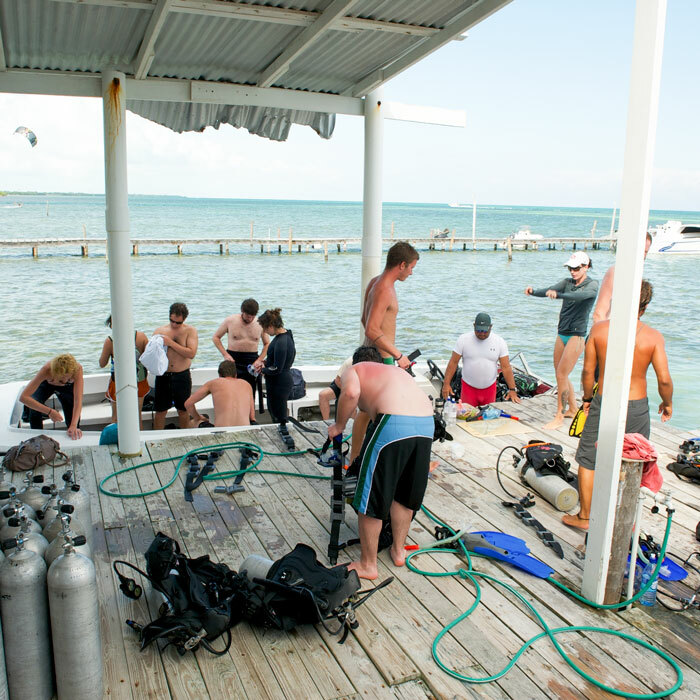 Meet at 8:30AM and finish your last Open Water Dive 4, generally at the Caye Caulker Marine Reserve, in 60ft/18m. We return around 12 noon. and dive tables, and a PADI certification card good for life. Divers 10-14 years of age are classified as Junior Open Water Divers. The course and requirements are the same, except for: 10- and 11-year old divers will dive to a maximum of 40ft/12m; and for any diver under the age of 12, Frenchie’s requires a parent to dive with the student. 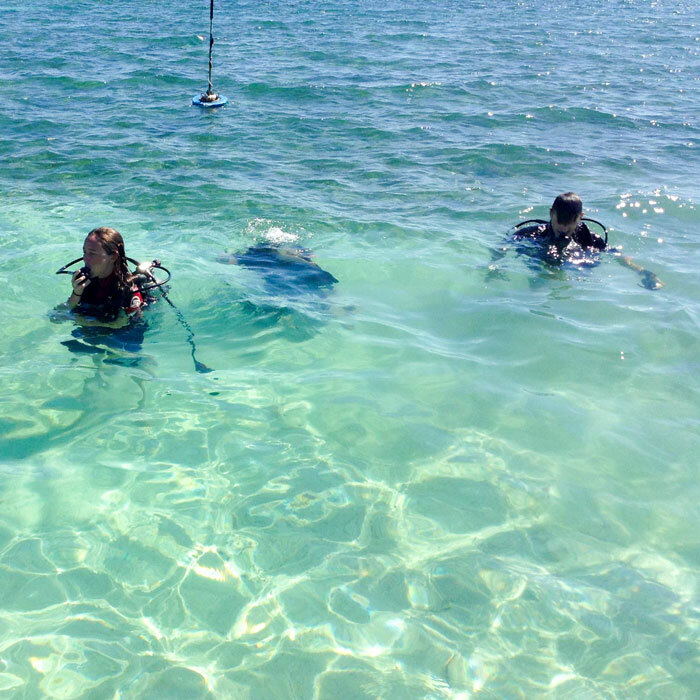 Once certified, the Junior Diver receives a Junior Open Water certification card that may be upgraded to an Open Water Diver card when the diver turns 15 (this does not require any additional course work; the student must arrange for an instructor to resubmit the application form). A certified Junior Open Water Diver must be accompanied by a parent, guardian or PADI professional. Referrals are for students who complete their pool work and course work prior to coming to Caye Caulker, and then, complete their certification with us in 4 Open Water Dives. Meet at 8:30AM and get fitted for your equipment (included in the course). Spend some time reviewing what you have already learned. Generally, we do Open Waters 1 & 2 in a “real dive spot” the Caye Caulker Marine Reserve in 40ft/12m. You can snorkel during surface interval. We return to the shop around 2PM..
Meet at 8:30AM and do Open Waters 3 & 4 in another “real dive spot” the Caye Caulker Marine Reserve in 60ft/18m. Snorkel during surface interval and return to the shop around 2PM. Includes: Equipment and a PADI certification card good for life. Start your Open Water Course at home by signing up for the E-learning on the PADI website by completing the written portion and then do your dives while on vacation. Make sure to read the course outline before signing up for the E-learning. Meet at the dive shop at 8:30am to go over the paperwork and to ensure that you have completed all quizzes and exams. Spend about 1hr discussing scuba skills with a Frenchies’ open water instructor and then take a 5 minute boat ride to the “Swimming Pool” to practice these skills. Return to the shop by 2pm. Meet at the dive shop at 8:30am to set up scuba gear and discuss required skills to be practiced on this day. Then we travel for 10 minutes to the Caye Caulker Marine Reserve and do 2 dives to a depth of 40ft/12m. You will spend a few minutes on each dive practicing the scuba exercises then the remainder of your bottom time will be spent diving around and putting your dive skills to the test. Return to shop by 2pm. Meet at the dive shop at 8:30am to set up your scuba gear and discuss skills to be practiced. The location is at the Caye Caulker Marine Reserve. You will again do 2 dives and spend the first 5 to 10 minutes practicing and mastering some scuba exercises then spend the remainder of the bottom time exploring a portion of the Belize barrier reef. Includes: Rental of equipment, Frenchie’s Log Book, and a PADI certification card good for life.